Kyrgyzstan is in the process of creating its first Open Government Partnership National Action Plan, one of the principal commitments of which is deepening the reform of the public procurement system. While the commitments are still to be finalized and approved, Kyrgyzstan is on the track of becoming yet another country to fully adopt e-procurement. This is a significant step not only for Kyrgyzstan, but the whole region of Central Asia. 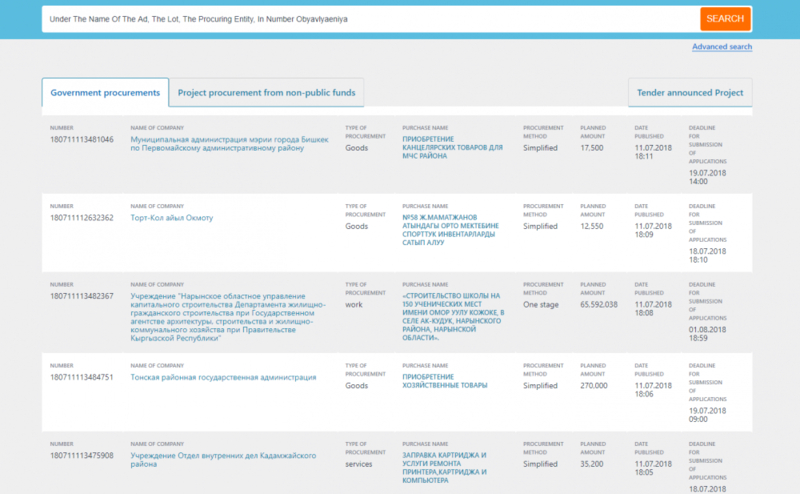 The public procurement reform in Kyrgyzstan has been ongoing for several years, legislative changes were made and a new electronic public procurement portal was created - www.zakupki.gov.kg. However, despite progress, the reform has been hindered by deficiencies of the legislative framework as well as insufficient financial resources to fine-tune all of the procurement procedure modules available on the electronic portal. The absence of these modules in a digital format does not allow procuring entities to fully implement the Law on Public Procurement, which creates a problem of enforcement. There is also an urgent need to integrate the electronic public procurement system with other information systems of government agencies. Taking into account that Kyrgyzstan is actively introducing IT technologies into all business processes in the state administration, electronic public procurement is one of the essential directions in the field of digital transformation. 1.1. Introduction of changes and additions to the current legislation in the field of public procurement with a view to its harmonization with the requirements of the Eurasian Economic Union (EAEU) Treaty, the WTO Agreement on Public Procurement and other international standards. 2.1. Integration of the public procurement portal with databases of the State Tax Service, the Federation Council, and the Ministry of Justice. 2.2. Finalization of the module on public procurement planning. 2.3. Development of the registration and execution of procurement contracts module. 2.4. Development of a request card for the formation of non-standard reports. 2.5. Development of modules: two-stage tenders, procurement of projects of international organizations, framework agreement, procurement of consulting services. 2.6. Development of the Feedback Module and creation of the Call-Center. 2.7. Introduction of functionality for online filing of complaints from interested parties that are not participants in the tenders. 2.8. Improvement of general classifiers of procurement of goods, works and services. 2.9. Development and implementation of software tools for data processing in accordance with international standards for open data. 2.10. Improvement of the functioning of the web portal in Kyrgyz and English languages. 2.11. Development and implementation of a function for evaluating bids in real time (online assessment). 2.12. Development of the electronic catalog. 2.13. Development of modules for carrying out sectoral purchases. 2.14. Development of the subsystem of public procurement audit. 2.15. Introduction of electronic signatures. 2.16. Introduction of API (application programming interface) in the web portal of government procurement. The main results of this reform will be the simplification of public procurement procedures, centralization of procurement processes, increasing levels of transparency of public procurement activities so they comply with the Open Contracting Partnership standards, additional savings on procurement procedures and increased efficiency of the public procurement system. With the successful implementation of the reform and the proposed OGP national action plan, Kyrgyzstan will also become more compliant with the TPPR standards of transparency and efficiency in public procurement.